Health • A group of doctors points to studies showing that exposure to PM2.5, as in Utah during inversions, may lower birth weight. Steve Griffin | The Salt Lake Tribune Bridget James is 5 1/2 months pregnant and is worried about how pollution will affect her unborn son. She uses an air purifier in her Salt Lake City home and doesn't go outside on red air days. . Steve Griffin | The Salt Lake Tribune Bridget James is 5 1/2 months pregnant and is worried about how pollution will affect her unborn son. 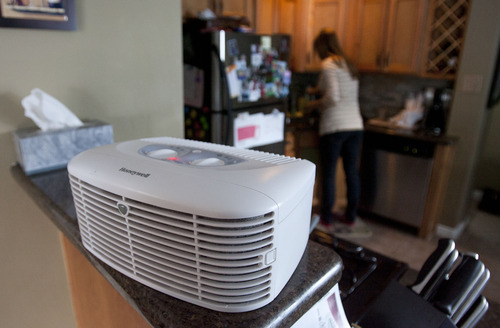 She uses an air purifier in her Salt Lake City home and doesn't go outside on red air days. Steve Griffin | The Salt Lake Tribune Bridget James is 5 1/2 months pregnant and is worried about how pollution will affect her unborn son. Her an air purifier cleans the air as she does the dishes in her home in Salt Lake City. If you&apos;re thinking about becoming pregnant, some advice on timing from a group of Utah doctors: Wait until the inversion season is over. A growing body of research is linking air pollution to negative birth outcomes, most often prematurity, low birth weight and restricted growth in the womb. Last week, a large study showed the risk of having a baby of low birth weight  meaning less than 5 lbs. 8 oz.  jumps 10 percent in areas with higher concentrations of particulate matter, including PM2.5. That&apos;s the pollution that spikes in winter inversions and leads to Utah&apos;s dubious distinction of having the worst air in the country. That study, published in the peer-reviewed journal Environmental Health Perspectives, used data from 3 million births in nine countries. Low birth weight is linked to problems in later childhood, including impaired intellectual ability, elevated blood pressure, diabetes and obesity. Data on pollution&apos;s impact on pregnancy can be inconsistent, depending on the type of pollution and level and timing of exposure, according to reviews by researchers, though there seems to be consensus that PM2.5 lowers birth weight. "Try to conceive in mid- to late-spring, after the inversion is over. That probably gives [a woman] the best window of opportunity for the critical first three months [for the fetus] to develop under the least amount of pollution," said physician Brian Moench, an anesthesiologist and president of Utah Physicians for a Healthy Environment. Better yet, he says, "get out of Salt Lake City to conceive." The 260-member physician&apos;s group says Utah&apos;s poor air quality is a public health emergency  particularly when it comes to pregnancy. 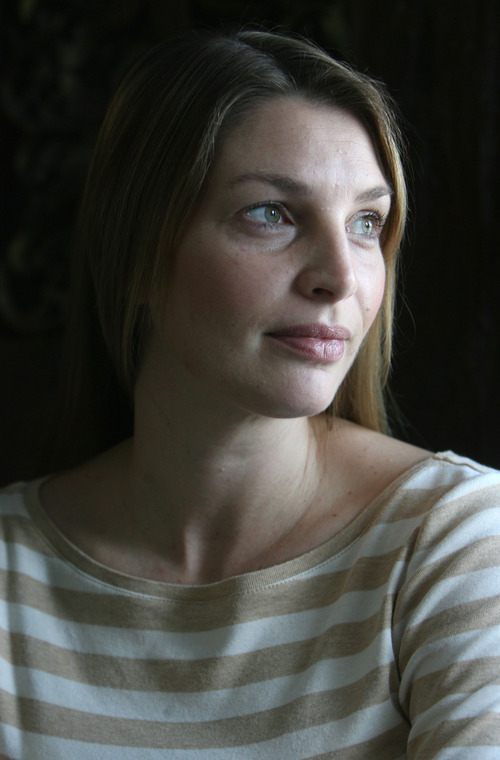 &apos;It&apos;s not good.&apos; • Pregnant with her third son, Bridget James is concerned. The East Millcreek member of Utah Moms for Clean Air uses air purifiers (since indoor air can be as bad as outdoor air), changes her furnace filter once a month and keeps lots of plants around. Normally active outdoors, she stays inside as much as possible. Or she takes her boys up to Park City to breathe the cleaner air. During the recent break in the smog, the 34-year-old bundled up and walked during a snowstorm. "I could barely see, but it felt so good to breathe fresh air." She believes her first son&apos;s autism was connected to the valley&apos;s poor air. Studies out of Los Angeles have found an increased risk for children living near freeways as well as for those exposed to more ozone or PM2.5, but no causal link has been established. "I don&apos;t foresee my family staying here that much longer," she said. "I can&apos;t live like this. It&apos;s not good for any of us." Researchers are not clear on how air pollution harms a fetus. Pollution may affect the placenta, reducing the flow of oxygen and nutrients to the fetus. It could cause inflammation, which other studies have shown can increase the risk of premature labor and pregnancy-induced high blood pressure. And it may damage fetal DNA, or put mothers at increased risk of infections that could lead to premature labor. That&apos;s according to a 2012 study published in Environmental Health Perspectives that showed among nearly 8,000 pregnant women in the Netherlands, higher exposures to larger particulate matter, PM10, starting in the second trimester was linked to a lower birth weight. Utah rarely exceeds the federal standard for PM10, but the study found effects at levels sometimes found at Utah air monitoring stations in Salt Lake City, North Salt Lake, North Provo and Ogden. &apos;A public health concern.&apos; • Frederica Perera, director of the Columbia Center for Children&apos;s Environmental Health, said the effects of air pollution on pregnancy aren&apos;t as bad as the known impact of maternal smoking on the fetus. Still, the evidence is troublesome, she said. "There is a modest but significant increase in risk of low birth weight, and given the fact that these exposures are so widespread, this is a public health concern," she said. Still, "women should not be constantly worrying about it." The Columbia center studies the health effects of prenatal and early-infant exposures to pollution. A 2012 study by Perera found that mothers&apos; exposure during pregnancy to pollutants called polycyclic aromatic hydrocarbons (PAHs)  found in traffic emissions, among other sources  was linked to symptoms of depression, anxiety and attention problems among their children at ages 6 and 7. The center&apos;s studies have also found that babies exposed to higher levels of PAHs in the womb can be born with cell damage that could increase their cancer risk. Pregnant mothers exposed to higher levels of PAHs were also more likely to have children who were obese by age 7 and who had lower IQs at age 5, according to center studies. The studies have largely focused on non-smoking, multiethnic women living in New York City. But results of air pollution studies can be mixed. Another recently published study, in the journal BMJ Open, examined 121,000 women in Sweden and "found no support for the contention that air pollution exposure in early gestation affects fetal growth." Still, it did link preterm birth and pre-eclampsia to exposure to ozone  a problem for Utah&apos;s urban core during the summer. Recent reviews of research on air pollution and poor pregnancy outcomes show there is a link, but the reviews call for more study. Moench agrees there should be studies  including among Utahns. But he said the research on pregnancy to date suggests cleaning the air is more than an economic or aesthetic imperative. It is, he said, a moral obligation. "No matter what stage of life you&apos;re at," he said, "you should avoid air pollution to whatever extent you can."